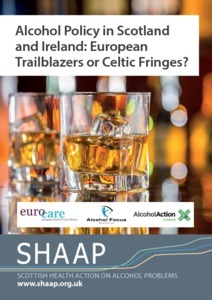 Home > Alcohol policy in Scotland and Ireland: European trailblazers or Celtic fringes? Scottish Health Action on Alcohol Problems. (2016) Alcohol policy in Scotland and Ireland: European trailblazers or Celtic fringes? Edinburgh: Scottish Health Action on Alcohol Problems.